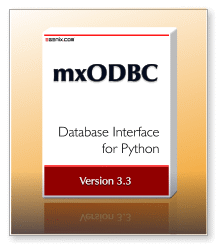 eGenix is pleased to announce the immediate availability of eGenix mxODBC™ 3.3.3 - Python ODBC Database Interface, with many advanced Python DB-API extensions and enhanced support of stored procedures with input, output and input/output parameters. Available for Python 2.4 - 2.7 on all major platforms. Improved tests and added more data binding tests, esp. for SELECT queries with bound parameters. Fixed some minor issues with the package web installer related to Linux2 vs. Linux3, FreeBSD installations and an intermittent error related to hash seeds, which sometimes caused prebuilt archives to not install correctly.